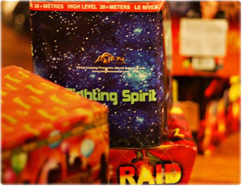 Buy Retail Fireworks at Wholesale prices for Canada! Rocket's Community Events Program provides extended discounts to large Street or Neighbourhood Parties or for Community Fireworks Displays. To qualify, your budget must be $1,200 + tax(es) or greater. We offer free, personal consultation to guide you in selecting your package and to ensure that your show will run smoothly and safely. Not only this, but we the Recommended Firing Sequence we provide will include a Grand Finale that leave your audience breathless! For more information on how our Community Events Program can help you, please contact us.